are all your factors constants or functional approximations? where is your evidence to confirm their definition for each factor, time, time change according to the history of time, what is space? The theory does not have factors other than the Planck's constant, which relates 3D Mass (inertial mass) to a dilaton projection wavelength and the speed of light. The theory reproduces the laws of physics and in doing so introduces two new constitutive parameters (elasticity anisotropy and elasticity). These parameters can be tested by looking at the predicted gravitational wave frequency and by measuring phase match angles of nuclear reactions. There are two more parameters (dephasings associated with transmutation notes, explained further in this blog), that are associated with the time it takes for an electron (proton) to rotate 90 degrees in the 3D space. They differ from constants in other theories since they have a very simple and physical meanings and come in a very small number. These six constants are the minimum information one needs to explain the whole Universe. Dilators are coherences between stationary deformation states of a local metric. 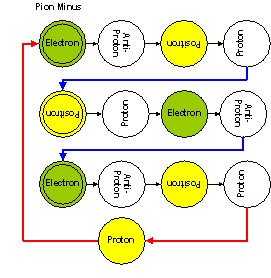 Lower (higher) state is associated with Proton(Electron). The initial state (in phase with the 3D Universe) defines the particle nature (proton, antiproton,electron or positron). Dilators are thin along the radial direction and spin at half the speed of tunneling, that is, when the wavefunction describing the dilator moves from one shape to another (180 degrees), the dilator profile rotates by 90 degrees. Pseudo-time quantization results from item 4). Interaction only occurs when the dilator has a footprint on the 3D Universe. Dilators motion along the 4D spatial manifold obeys the Quantum Lagrangian Principle which states that dilators always dilate in phase with surrounding dilaton field. Items 6, 5 and the embedding of the 3D lightspeed expanding hyperspherical shockwave Universe within a 4D spatial manifold allows for the uncertainty that creates Quantum Mechanical behavior. This means that the Hypergeometrical Universe provides the reasons for the observed Quantum Mechanics. The two cross-sections shown at the top of this and almost any other posting here, shows that the Hypergeometrical Universe contains an Absolute Time, a preferential direction but the absolute time cannot be used to time anything other than the Universe expansion. The preferential direction cannot be seen within the 3D expanding Hypersphere where we live. At any de Broglie step of the Hypergeometrical Universe expansion (one step is equal to the Compton wavelength of a Hydrogen atom), the dilator has to move itself by distance x to satisfy the Quantum Lagrangian Principle, that is, to dilate in phase with the surrounding field. In this picture, I show two angles. Alpha1 is the arctan(x/Lambda1), where Lambda1 is the Compton Wavelength of a Hydrogen atom (around 10^-15meters). If you are a charged fundamental dilator (non spin zero dilator), your k-vector is now along that new direction. If you are a neutral particle (e.g. a hydrogen atom or a neutron), you will also move yourself by distance x, but your k-vector will only point along angle alpha0 or thereabouts. Angle Alpha0 is arctan(x/(R0+lambda1), where R0 is the radius of the Universe (equal to 21.72 billion light years). The Universe is actually 21.72 Billion Years old, by which I mean that this radius is consistent with the Pioneer Anomaly (it was derived from the Pioneer Anomaly observations) and explains everything in Cosmology. There is another way to calibrate this radius but I would need the redshift data for all the Stellar Candles. That would be an independent measure of the age/radius of the Universe. This difference in change of direction rate (the change in direction happens at each de Broglie step of the expansion) explains the difference in strength between electromagnetic and gravitational forces. This means that the "force" represented here by the dilaton field and the Quantum Lagrangian Principle is the same. What differs is what the "particle" does in response to that interaction. This is real Grand Unification. If you look at the plot below for a neutron dilation levels you can find the meaning of electron neutrinos. They correspond to the subcoherence between protons and electrons. These subcoherences (half-electron neutrino each) correspond themselves to rotations within the 3D space (as opposed to tumbling withing the 4D spatial manifold). 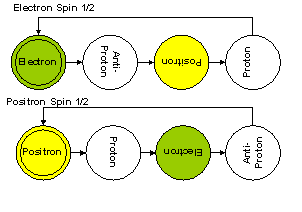 The dephasing associated with this rotation defines the mass of all isotopes, that is, one parameter is used to calculate the mass of everything that is composed of protons and neutrons. Here the red lines correspond to the already know half-electron-neutrino. The blue lines correspond to a new dephasing process. Derivation is simple and it is on the pdfs. Where C1 and C2 are the charges traveling at V1 and V2 and c is the speed of light. For Gravitational one has exactly the same equation (Gyrogravity). This equation is consistent with Pioneer Anomaly , Gravitational Lensing , the Precession of Mercury Perihelion and explains the Galactic Puzzle (the constant angular speed of mass distributions within spiral galaxies). All these demonstrations are posted within this blog. This means that one equation describes Electrostatics, Magnetism and Gravitation and this equation was derived from first principles using the fundamental hypotheses presented above. Hubble measurements using short distance calibration indicates that the Universe is around 14 billion years old. Standard Stellar Candles (Supernovae type 1A) which are supposed to have constant luminosity through all ages of the Universe life, indicates that the furthest observed Stellar Candle to be around 50-60 Billion light years away. This conclusion is arrived by observing exceedingly weak supernovae type 1A explosion. The weaker the supernovae luminosity the larger the distance inferred (apparent luminosity decays with the inverse of the distance squared). To prove that my theory provides the reason for Quantum Mechanics is trivial and will be presented later in this blog. Only only needs to eliminate the large dilator number approximation (as mentioned many times here and in the pdf containing the theory). This approximation expresses the concept that when one interact large number of dilators in a body, the observed wavelength decreases with the mass (number of dilators). This is the result of the interference pattern along any direction in the neighborhood of a macroscopic body. This approximation was used to derive the equations for the "Natural Laws", which are macroscopic laws. If you try to use these laws directly in a microscopic problem one wouldn't obtain a quantum mechanical behavior, unless you come up with a contrived theory like QM and an ad-hoc equation like Schroedinger's equation. When dealing with a single dilator or a small number of dilators as in a molecule, one cannot use this approximation. Not using the approximation means that particles will dance in a four-dimensional lightspeed traveling Lissajous interferometric pattern. This pattern is imprinted on space itself as dilaton waves interference. I am agnostic with respect to the proposition that space is being created ahead of the hypergeometrical universe expansion or if there is already space there...:) That is irrelevant because it cannot be tested. Space itself, as far as I am concerned, is just a Cartesian medium which presents no friction, no dephasing events and has a restoring force (elasticity). I am agnostic with respect to any sub-structure since I don't believe any experiment could probe any substructure. The reason is that colliding particles also follow the Quantum Lagrangian Principle, that is, they are always in quantized positions determined by the interference pattern of the dilaton field during their interactions. A cartesian space would work for all two cross-sections if I didn't have to reproduce current relativistic views. Current views based upon the choice of dynamic laws requires TauXYZ (spacetime) to be hyperbolic, thus the hyperbolic tangent in the Hypergeometrical Universe Newton's Second Law. Huygens and Newton debated how to describe the dynamics of interacting bodies. Newton won. 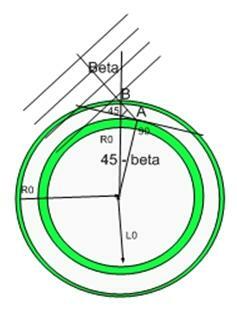 Let's make Area 4D =1 then Area3D is just the overlapping of the unitary dilator 4D volume with the Fabric of Space. Notice the hyperbolic tangent on the 3D Strain. This is a requirement for relativity. 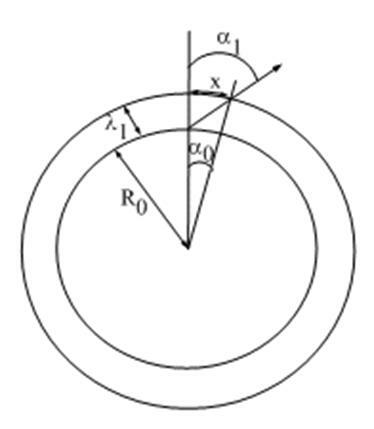 Even though the dilator moves in the RXYZ following an interference pattern, the dynamics has to be described in the TauXYZ. In that cross-section, wavelengths vary with velocity and one cannot simply imagine motion through an interference pattern. Here one has to take into consideration Doppler shifts of the dilator wavelength while creating the 3D Lissajous figures where dilators will pop-up at each de Broglie step of the Universe expansion. Of course, these Doppler shifts are measured in the Schroedinger equations as changes in momentum or forces. Had Huygens followed this simple reasoning, he would have discovered Quantum Mechanics.